Overview: This is a nice hike in the Phoenix area offering hills and views and a well maintained trail. It is easy to get to and the numerous trails allow for a variety of hikes. I have used the names of the trails given in the map posted at the trailhead. On planning maps the trails are numbered and I have included those numbers. Some numbered segments have previously been described on HikeAZ as individual hikes. This trail, now called the Circumference Trail (CT), is comprised of trail numbers 1, 2, 3, 6 and 4. Hike: This loop hike is described in a clockwise direction so that most of the climbing is during the earlier part of the hike. From the parking find the trail at the west end of the parking lot. Follow the trail uphill for about .6 miles to a junction (N33 43.793 W112 08.874). To the right is the Basalt Trail (previously called Trail 1). Turn left here to stay on the Circumference Trail (this part previously called Trail 2 on some maps). Pass a couple more junctions which are really cutoffs to the Paradise Trail as it goes in a westerly direction. At about 1.2 miles (N33 43.572 W112 08.567) you reach the junction with the Paradise Trail (Trail 2 on the right). Turn left here and the CT loops around to head west passing through some nice Sonoran Desert (This was previously Trail 3). At about 2.1 miles (N33 43.690 W112 09.178) is another junction where you should keep left to stay on the CT (Trail 6). You will now be headed downhill and then around the side of the main hill here. Follow this past the athletic fields and back around the north side of the hill. At 4.4 miles (N33 43.924 W112 09.353) after some climbing the Ridgeline Trail (Trail 5) comes in from the right. Continue straight on the Circumference Trail. At 4.6 miles you reach another junction with the Basalt Trail (Trail 4 in this area) (N33 43.809 W112 09.213). Turn left here and follow this trail down toward the CAP canal. You'll hike along the canal on a two-track for a short distance and then bear right at a fork at about 5.3 miles. Continue following this two-track until it crosses a paved road and ends at the trailhead and your car. Total distance about 5.9 miles and AEG of 1,240 feet. This hike can be confusing in places because there are a number of trails and junctions, and at the time I did the hike, none had any signage indicating what trail you were on or what trails went where at each intersection. 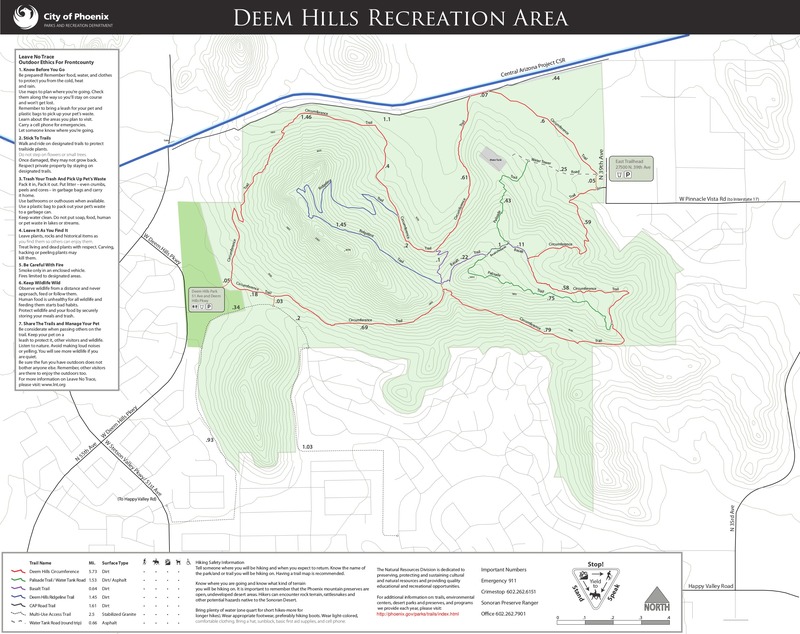 There is a map showing the trail names at the trailhead. A GPS track is very helpful. I've tried to describe the turns to make it easier to follow without a GPS and hopefully the city will put signs up in the future. 2012-01-16 mirage1 writes: There are signs now, and they're very good. It's very clear which way to go at each junction. And, they have mileage posted every .25 miles around the circumference and on the ridgeline trail (not sure about the others). From I-17 take exit 218 and head west on Happy Valley Road. Turn right at 35th Ave (a traffic light) and follow this as it turns into Pocono Road (33rd Ave) and you reach a stop sign at Pinnacle Vista Drive. Turn left (west) and follow until it turns right becoming 39th Ave. The trailhead is ahead on the left just as the yellow line ends. To get back to I-17 after the hike take Pinnacle Vista Drive east until it ends at the I-17 frontage road. Turn right and come to the Jomax Rd interchange where you can accesss I-17 north or south bound.